The third ca ble car route over Ba Na Hills in the central city of Da Nang has won four Guinness World Records, informed the Ba Na Service Cable Car Joint Stock Company on March 10. This is the only cable car route that has received four Guinness World Records. The four Guinness World Records are for the longest cable car route of 5,771 meters; the highest altitude difference between departure station and destination station with 1,369 meters; the longest cable with 11,587m and the heaviest cable roll with 141.24 tons. This cable car route has been built by the Austrian company Doppelmayr Cable Car and the Swiss company CWA Constructions at a total cost of US$39 million. The route will be inaugurated and fully operational from March 29, on occasion of the 38th liberation anniversary of Da Nang City. The entire route has a total of 86 cabins which can accommodate ten persons each. 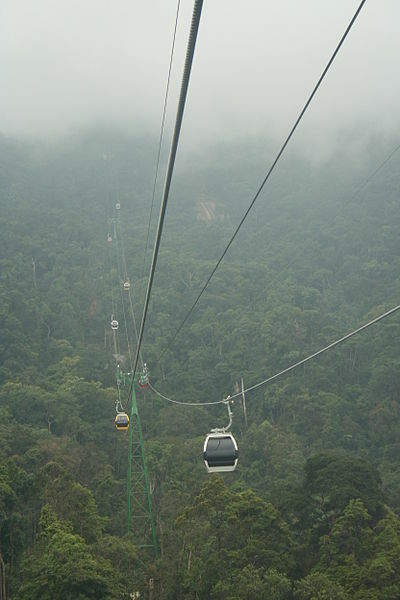 The cable car speed is six meters per second and has capacity to carry 1,500 visitors an hour. This cable route will ease overloading at the first and second cable car routes on Ba Na Hills, and is expected to receive about one million visitors this year.